If there’s one thing that’s ignored all too often at retirement, it’s the impact that taxes will have on your life. Your tax return can change a LOT once you’ve gone from working mode to retirement mode. 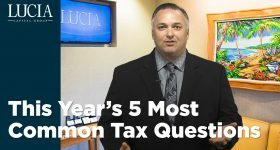 Here are a few tax issues you need to be aware of. First, some of your deductions may go away. Since you’re not working, you’ll lose the tax breaks from your 401(k) and IRA contributions. If your house is paid off, you no longer have a mortgage interest deduction, and starting this year, taxpayers age 65 and over can deduct only those medical expenses that exceed 10 percent of AGI. It was 7.5% last year. 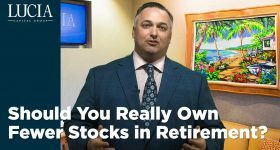 So it might be a good idea to bunch up any elective medical expenses you have into one year if possible, and to maybe contribute as much as you can to your retirement plan in your last year of work. Second, you could be in a higher tax bracket at retirement. Of course, this isn’t always the case, but once you hit RMD age at 70 ½, those distributions could push you into a higher bracket. Couples filing jointly who have just shy of $76,000 of taxable income this year are in the 15 percent bracket, but if you toss in the extra money you’ll have to take from your tax-deferred accounts, all of that extra income will be taxed at the 25 percent rate. This is why we sometimes recommend doing Roth conversions before RMD age. If you do it right, you can take the money out and stay within your current bracket. And a Roth has no RMD for the owner. Something else: those RMD’s I mentioned a moment ago? They could also subject your Social Security benefits to taxation. This is a surprise to a lot of people who thought their benefits were always tax free. Not true. 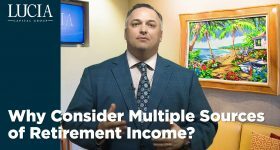 The IRS formula uses half of your benefit amount and adds that to other income you receive. If that amount exceeds $25,000 for singles or $32,000 for joint filers, a portion of your Social Security benefits will be taxed. And here again: if you’re able to do some Roth conversions before age 70 ½, you might be able to avoid this tax hit as well. Remember, money you take from a Roth does not count as income for Social Security taxation purposes. Nobody should have to pay more in taxes than they’re legally obligated to do, which is why tax planning at retirement is SO important. It’s all about strategy, folks. It’s what we do every single day. Give us a call – we’re here to help. 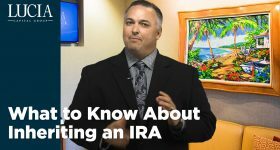 IRA withdrawals will be taxed at ordinary income rates. Withdrawals prior to age 59½ may also be subject to a 10% penalty tax. Roth IRA distributions of principal from a Roth IRA are tax-free; however, any earnings will be taxed at ordinary income rates and a 10% penalty tax will apply if withdrawn prior to age 59½ or within five years of the date the Roth IRA was established, whichever is longer. The information provided is based on current laws, which are subject to change at any time. Lucia Capital Group is not affiliated with or endorsed by the Social Security Administration or any government agency. Social Security rules can be complex. For more information about Social Security benefits, visit the SSA website at www.ssa.gov, or call (800) 772-1213 to speak with an SSA representative. There is no guarantee that any investing or financial planning strategy will be profitable, provide protection from loss or meet its stated objectives. imply a certain level of skill or training. Advisory services offered through Lucia Capital Group. Securities offered through Lucia Securities, LLC.